Outlook is a powerful application for managing your email, contacts, and calendar. Follow these steps to find out which version of Outlook is installed on your computer. You'll find your version and build number under Product Information. For example, the following displays for Microsoft Office 365 ProPlus, which includes Outlook. If you need to know whether you're using the 32-bit version or the 64-bit version of Outlook, select About Outlook. The top of the About Outlook box shows the version number and 32-bit or 64-bit distinction. Am I running Outlook for Office 365 Monthly Channel or an Insider build? Some Outlook features are only available as part of Outlook for Office 365 or the Office Insider program. Select File > Office Account. 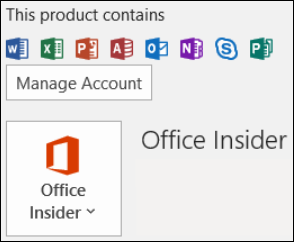 If you see Office 365 or Office Insider, you're running Outlook for Office 365 Monthly Channel or an Insider build. If you’re using Windows 10, and your Outlook doesn’t match the images here, there are two possible reasons. You’re using an older, unsupported version of Outlook, such as Outlook 2003. You can often find the Outlook product version by selecting Help > About. You’re using Windows 10 Mail. Windows 10 Mail is a free program included with all Windows 10 computers. If you’re using Windows 10 Mail, your Inbox will look something like this. To learn more about Windows 10 Mail, see Windows 10 Mail and Calendar FAQ. 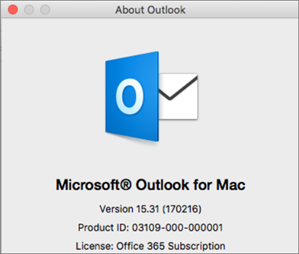 Follow these steps to find out what version of Outlook is installed on your Mac. 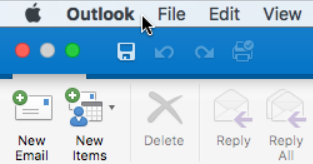 On your menu bar, choose Outlook (next to the Apple logo). If you don't see your menu bar, move your mouse to the top of your screen and it will appear. Choose About Outlook. The version information appears. If you have Outlook through your Office 365 subscription, it won't display 2016 or 2011. To access online versions of Outlook, first connect to the Internet. Then sign in to your email the same way you sign in to Facebook, Amazon, or Netflix. Outlook.com / Hotmail.com is a free, web-based email service from Microsoft. Because Outlook.com is a service that you access over the Internet, it is not installed on your computer, and doesn't have version information. 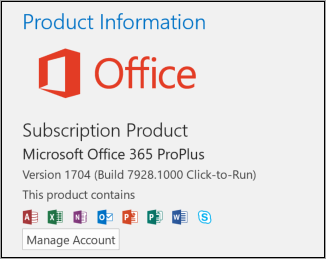 If you have Office 365 for a business subscription, your plan includes access to a version of Outlook that you can access anywhere there's an Internet connection. Outlook on the web is especially useful if you have email accounts with multiple services, because you can manage all your email from one place. Add your email address to the Outlook app. It will sync with your email service and your email and contacts will appear. Choose from the instructions listed here: Import and export Outlook email, contacts, and calendar. Outlook Web App is used only in work or school environments that are hosting their own Exchange Server. To get to your contacts, from the app launcher click People. If you have an iPhone or iPad, you're using Outlook for iOS to manage your email, calendar, contacts, and files. You can add any email account that uses POP or IMAP, as well as Outlook.com, Office 365, Gmail, Yahoo, and Exchange accounts. In Outlook on your iPhone, select Settings > Help & Feedback. Scroll to the bottom of the page. The version number appears there. Need help using Outlook for Android?